I posted my series Evidence almost a year ago but I never really explained the story behind it. My official artist statement is below, but here is a more candid account of how this series came to be. I graduated from Pacific Northwest College of Art last December and Evidence was my thesis project. During my research, I examined my love for horror movies and a cultural fascination I noticed with death...or maybe just my own fascination with death. Dark I know, but I was curious about my tendency to envision horrific scenarios such as my car flying off the side of a bridge each time I drove over one. I live in Portland, there are a lot of bridges here, so this happened a lot. I also just kept thinking about that general desire to gawk when driving by a car crash. Let's face it, we don't want to see but deep down we kind of do. I became obsessed with that line of wanting to look and wanting to look away. Kind of like a kid covering their eyes during a horror movie but then peeking through their fingers at the last minute. Anyhow, somewhere along the line I stumbled across a book a friend had given me almost a decade ago of vintage crime scene photographs. The images were horrific, yet beautiful. In the was a reference to Weegee, the most famous tabloid crime scene photographer of all time. I had known about Weegee but this was were I really decided to start studying his work. For 6-months I woke up almost every day and looked at Weegee's photographs. I guess it is like waking up and watching an episode of Law and Order, I just started by day with a cup of coffee and dead bodies. I sound like a weirdo saying that and believe me I felt like one at the time too but my research continued. I didn't want to add to the imagery of bodies in my own work. I felt there was enough of that already happening and L.A. based photographer Melanie Pullen had already done exactly that with her High Fashion Crime Scenes. So, I decided instead, to loosely recreate Weegee's images without the bodies out and fill their absence with a magical light and various objects that would symbolize the horrific event. Here are just a few of my images, next to Weegee's images I am referencing, followed by my official artist statement. To see the rest Evidence, click here. To learn more about Weegee, I recommend checking out his first book, Naked City or a good old fashion google search. Lindsey Rickert, "Item #7...Trunk", from Evidence, 2012. Weegee (Arthur Fellig), “The Trunk Murder,” In “Speaking of Pictures…A New York Free Lance Photographs the News,” Life, April 12, 1937, 8. 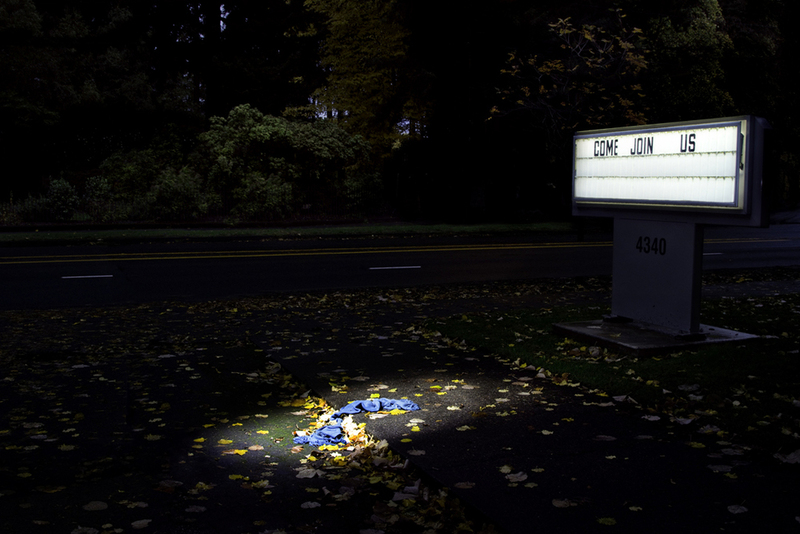 Lindsey Rickert, "Item #19...Blue Scarf, from Evidence, 2012. Weegee (Arthur Fellig),”Joy of Living,” 1942, In “Weegee’s Voyeurism and the Mastery of Urban Disorder, 22. In, Evidence, I examine my own peculiar allure to death and violence. Through a series of seven photographs I attempt to question this curiosity while avoiding merely contributing to the abundance of violent imagery already existing in our media-saturated culture. When analyzing popular media, it becomes quickly apparent how immersed our culture is in violence, death, and destruction, whether real or simulated. Countless television crime shows fill the channels, and our local and national new sources constantly pump fear into our minds. Even advertising has resorted to capitalizing on our culture’s addiction to violence as a way to sell products. The image of death has become so pervasive; we have become ambivalent and desensitized to it. Underneath all this sensationalism, I am compelled to ask, why are we attracted to images of death, and how does our image-driven culture impact how we internalize horrific imagery? Through my artistic investigation I reference the work of Weegee due to his contribution in popularizing violent imagery during his stint as a 1930s and 40s tabloid crime photographer. However, rather than including or even glamorizing the corpse, in my work I chose to omit it completely. Each image in Evidence reads as a subtle homage to Weegee’s oeuvre through the use of his iconic objects such as a steamer trunk, a bucket of melons, or a marquee sign. Implied violence is also represented by splattered milk or crushed eggs while the absence of the corpse is replaced through the symbolic use of light.